Perennial herb from a fibrous root and short rhizome usually from a single crown, with several leafless runners; stems trailing, rooting at the nodes; runners, leaf stalks and flower shoots with long spreading to appressed hairs and usually greenish not reddish-tinged. Basal in rosettes, palmately compound, on stalks 2-15 cm long; leaflets 3, egg-shaped, short-stalked, 2-7 cm long, the lower surface smooth to silky-hairy, the upper surface smooth and glaucous bluish-green, the margins coarsely toothed, the terminal tooth less than 1/2 as wide as and shorter than the adjacent teeth. Inflorescence an open cluster of 2 to 15 stalked flowers atop axillary, leafless shoots that are usually shorter than the surrounding leaves at maturity; corollas white, the petals 5, egg-shaped to round, 4-9 (12) mm long; calyces long-silky-hairy, 5-lobed, the lobes (sepals) lance-elliptic, 3-7 mm long, alternating with lanceolate bractlets that are shorter than the sepals; ovaries superior; stamens about 20. Strawberries, hemispheric, about 1 cm wide, covered with achenes; achenes about 1.5 mm long, partly sunken in the fleshy receptacle. 1. Leaf-stalks and flower-shoots with appressed hairs; petals mostly 4-10 mm long, narrowly egg-shaped....................... var. glauca S. Wats. 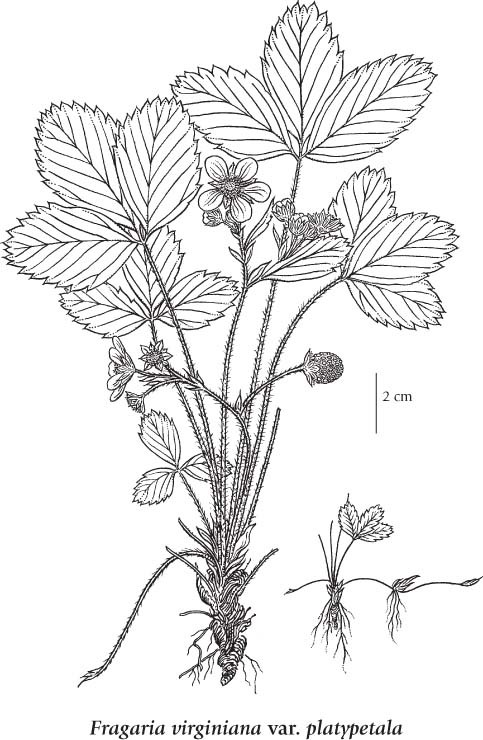 Moist to dry fields, roadsides, meadows, grassy slopes, thickets, forest edges and open forests in the lowland to subalpine zones; common throughout BC; N to AK and NT, E to NF and S to CA, CO, TN and GA.
Fragaria glauca (S. Watson) Rydb. Fragaria platypetala var. sibbaldifolia (Rydb.) Jeps.